I’ve had an on-again-off-again relationship with the stories of H.P. 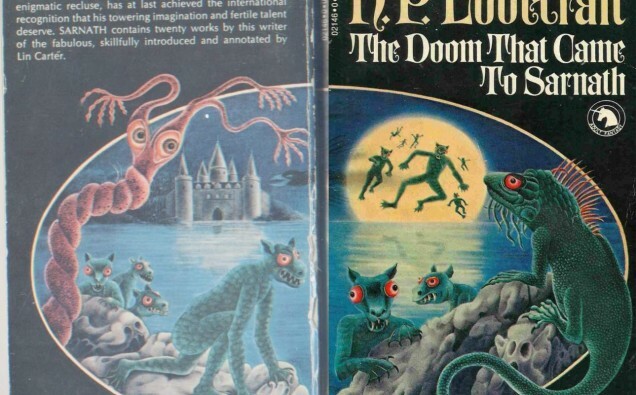 Lovecraft for the last 23 years. I’ll spend a few months reading him regularly, then put him down for years; and I’m generally as likely to re-read a story I already know as to venture into untested waters. So, despite having been a fan for the better part of a quarter of a century, I probably haven’t read more than a couple of dozen of his works. I’ve decided to correct this. I’m going to start working my way through his stories in the order they were written and reviewing them, at a rate of roughly one per week (though I may slow down a little when I get to longer works – I do intend to keep reading other authors, after all). You can find a list of previous entries here. 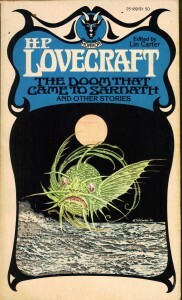 Written not more than a month after “The White Ship” (1919), “The Doom that Came to Sarnath” is the second of Lovecraft’s efforts to create a whole fantastical realm, a place of legend. However, where “The White Ship” is a sort of surreal or oneiric narrative, about worlds that exist parallel to our own, “The Doom that Came to Sarnath” is framed as a piece of obscure but earthly history. 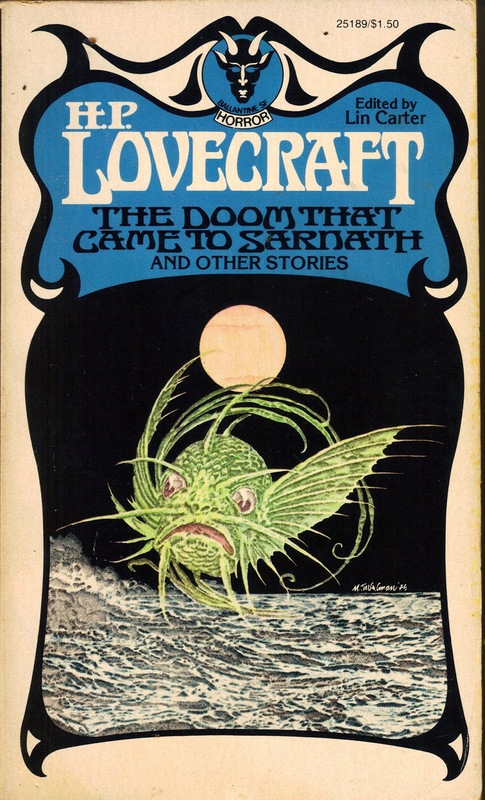 In the interim, Lovecraft had written “The Street” (1920, not reviewed in this series owing to the absence of any horror elements), in which he related the story not of a character, but of a piece of land, as it experienced centuries of history. Likewise, “The Doom that Came to Sarnath” has no focal character; it is the millennium-long story of a city, both its geography and the race of people who inhabit it. Sarnath is built at the far edges of man’s domain, and near its borders dwell the last remnants of an older species, whose kind have long since faded from the rest of the world. The people of Sarnath find themselves inexplicably disgusted by these creatures, and hold them in utter contempt. And so they wipe out this ancient race, and steal as a trophy the great statue of their god, Bokrug. 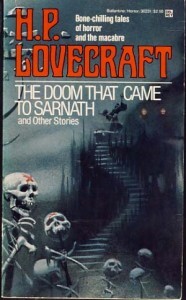 However, strange events descend on Sarnath; the idol disappears, and the city’s high priest is found dead, who in his last moments has scrawled a message of “DOOM” (always printed in all caps by Lovecraft) upon the empty altar. Lovecraft goes on to describe the thousand years of prosperity that follow for Sarnath, of the majesty of the city’s walls and towers, the wise and noble gods worshipped there, and the way that fear of Bokrug passes from the consciousness of the city’s inhabitants. Finally, Lovecraft leads us to the night, exactly 1,000 years after the destruction of Bokrug’s worshippers, that the ancient race return to life to exact their revenge upon Sarnath. In a way, “The Doom that Came to Sarnath” is like a haunted house story, with the sins of past inhabitants coming back to haunt and torment the descendants of those who wronged them. But the scale is like that of a Greek myth, with the teeming capital city of a whole continent brought down by the wrath of a wronged deity. It is at once high fantasy and classic horror. Unfortunately, it is too brief a tale to really integrate both elements satisfactorily. The story is just over 2,500 words long, which leaves little room for either the first people of Sarnath or the last of their line 1,000 years later to be treated with any depth or nuance. The story is packed with details – mostly thorough descriptions of the structure and fineries of Sarnath – but those details don’t exist in any meaningful context. And Lovecraft again indulges in assigning silly fantasy names to people and places; this would be excusable if he took the time to develop these characters and realms, but Lovecraft is content to just let them sit there, alienating and unjustified. “The Doom that Came to Sarnath” is an interesting exercise in style and structure, but it lacks depth and resonance. Like so many of these early tales, it is a hint of more engaging and impactful works to come, but not a particularly enjoyable read in and of itself. This is another of the Lovecraft stories which Jason Thompson has adapted in comic form for his website, Mockman.com. Rendering the city of Sarnath in pictures rather than florid phrases makes for a less tedious experience, but the horror that finally befalls the city is better served by the more abstract description given in the story than by anything the concrete nature of a visual medium can provide. The Blood Shed is the home of a lot more reviews, as well as news, stories, essays, and basically all things horror. Also, when you have a minute, hop on over to our Facebook page!